NEW YORK — Shares of Alibaba jumped on Thursday as the Chinese e-commerce powerhouse added shoppers and mobile revenue surged. Alibaba, which went public in a splashy IPO in 2014, accounts for 80 percent of all online shopping in China. Its shares have fluctuated over investor concern about the state of China's economy. But investors were reassured by the quarterly results, sending shares up almost 6 percent in morning trading. 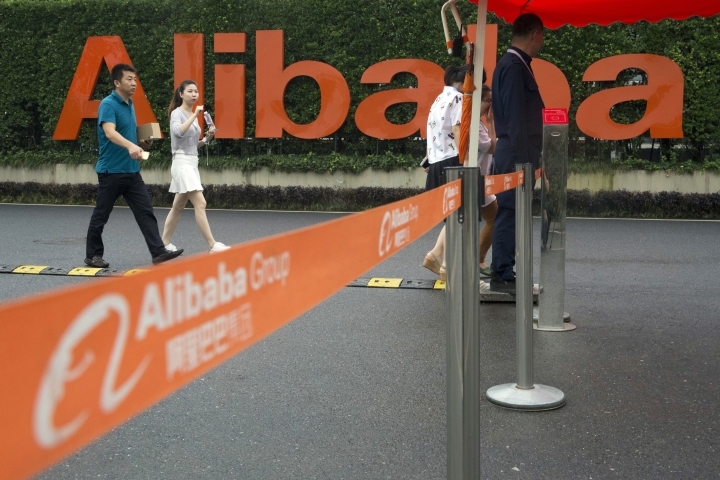 Alibaba Group Holding Ltd. on Thursday reported fiscal first-quarter earnings of $1.14 billion. The Hong Kong-based company said it had profit of 44 cents per share. Earnings, adjusted for stock option expense and amortization costs, were 74 cents per share. The online retailer's revenue jumped 59 percent to $4.84 billion in the period, also beating Street forecasts. Seven analysts surveyed by Zacks expected $4.61 billion. Revenue from mobile shopping more than doubled to $2.64 billion. The company added 11 million annual active buyers from the prior quarter, bringing total active buyers to 434 million. Revenue from cloud computing, a small but growing segment for Alibaba, more than doubled to $187 million. "With both international and domestic sales forging ahead, and with new areas like cloud computing making a better contribution, Alibaba is firmly on an upward trajectory," said Conlumino retail analyst Hakon Helgesen. Alibaba shares rose $4.89, or 5.6 percent, to $92.22 in afternoon trading Thursday.